Since we only have one bathroom we end up having to share with Bailey our cat. I really do not enjoy stepping out of the shower all nice and clean and getting cat litter all over my feet. We decided we needed something to contain Bay's litter but didn't want to give him one of those tiny enclosed boxes, it just didn't seem very nice. 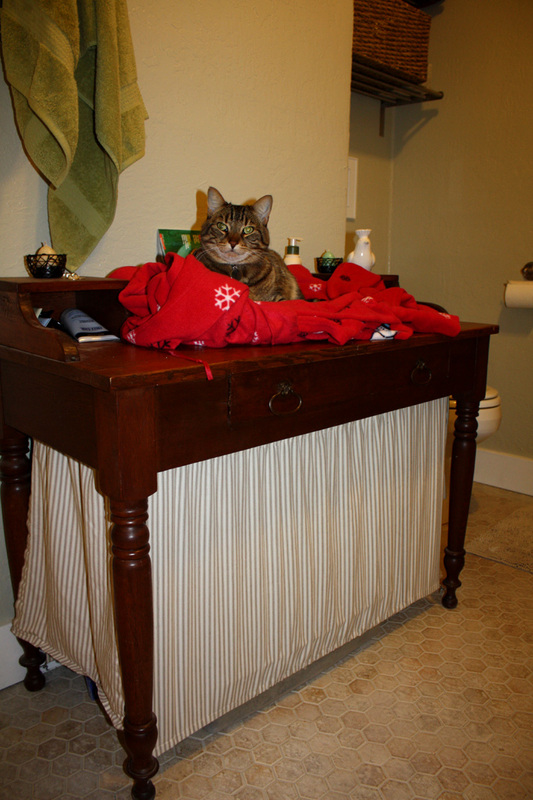 On one of our yard sale outings we found an old desk that we could modify to hide Bay's cat box. 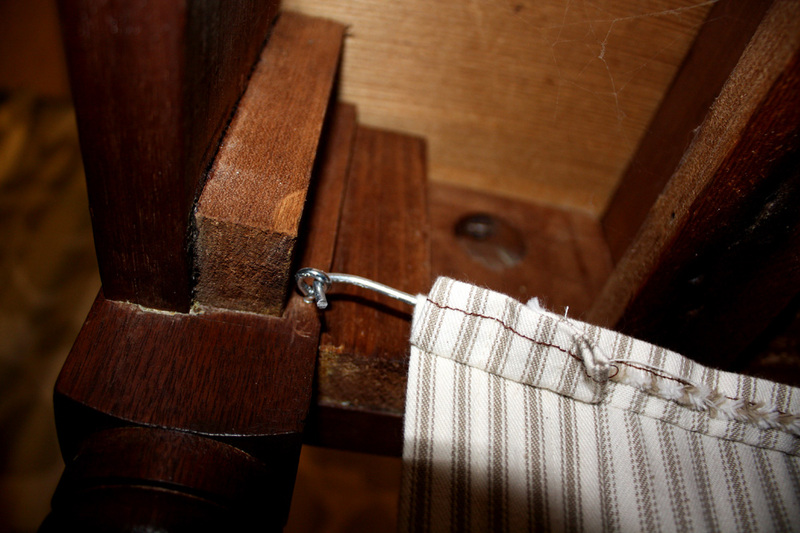 So I devised a plan to place curtains around the bottom of the desk strung along wires so the curtains could be easily removed for cleaning. I used eye screws to hold the wires in place on the inside edges of all four legs. I chose a taupe and cream colored ticking-stripe fabric to fit in with the neutral colors of the bathroom. I sewed a channel along the length of the fabric to feed the wire through for hanging. For the front and back of the desk I sewed channels on both the top and bottom edges to keep the fabric taut. For the two sides I only attached the fabric along the top. One of the sides I made half the height of the other sides so Bay can easily find his way in. Here you can see the finished product with Bay laying on my robe on top, his usual hang out spot. So besides providing Bay with some privacy, it also gives him a place to sleep...........and a place to set our clothes.